We might not see it outright but Rosie is part Puerto Rican and of course very American. Rosie has been here in our island for three months now as a volunteer for All Hands. All Hands as we all know has been instrumental helping to rebuild out community post Typhoon Haiyan and Ruby. 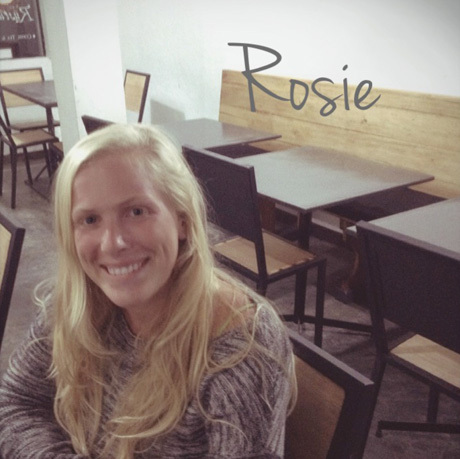 Rosie has been a part of an All Hands' project in collaboration with another NGO called "Street Lights." The projects they are currently working on right now are in Tagpuro, Leyte, and she is helping in the realization of four large buildings. LL: Hi Rosie, can you describe the place and vibe where you come from? RA: I was living in Portland Oregon where there’s good food, extreme types of people, nature lovers, vegan-ism, animal lovers; it’s set in the mountains. It has stunning nature and I worked as a delivery girl as well in a farmers market. LL: What was your life like before you came? RA: I had a great time in Portland, sometimes I’d do deliveries, but I knew it was a temporary thing. I have been also traveling, I love to travel. LL: What's your impression of our place? RA: I love it so much, the most friendliest people, I have traveled around, I always meet people who invite us into their houses, offer us food. I feel completely safe, I walk around the street and everyone is my friend. LL: What pivotal moment made you choose to become a volunteer/aid worker? RA: I’ve always been interested in humanitarian efforts, I volunteered after Hurricane Sandy. This summer I am going back to school, I am looking into disaster relief or medicine as a major. I want to volunteer more. LL: Has your experiences here affected or changed you as a person? And do you think that your experience here will be useful for you in the future? RA: Absolutely, I definitely want to be part of disaster relief efforts, I am just going to volunteer. LL: Given all that has happened in the world, the news we see, the political and religious upheavals between countries an ideologies, there’s terrorism and the natural disasters which we cannot control. Do you feel there is hope for the future of our planet? RA: I think that absolutely, bad things are going to continue to happen, but there are people who step up and you see more and more of that. People going out of their ways to help and give to people in need. LL: Given an opportunity to resolve one global issue or conflict happening in the world right now, which one would you take a gander at? RA: World hunger, everyone should have something to eat. LL: Apart from volunteer work or being an aid worker, what’s the next best thing that makes you eloquent or effusive with words? RA: traveling that’s my biggest passion. I also like mountaineering; I’ve already traveled to india, Sri Lanka and Africa, I like places that has great culture. LL: What’s next for you? RA: The holidays, I am going home but I am hoping to come back. LL: Wanna play one-word-answer questions and Bonus Q? Bonus Q: If you were given the power to spend 2 hours with someone who has passed on, who would it be and why? RA: Jimi Hendrix, because he is the sexiest man that ever lived. Thank you for those great answers and thanks for being a part of our community Rosie.